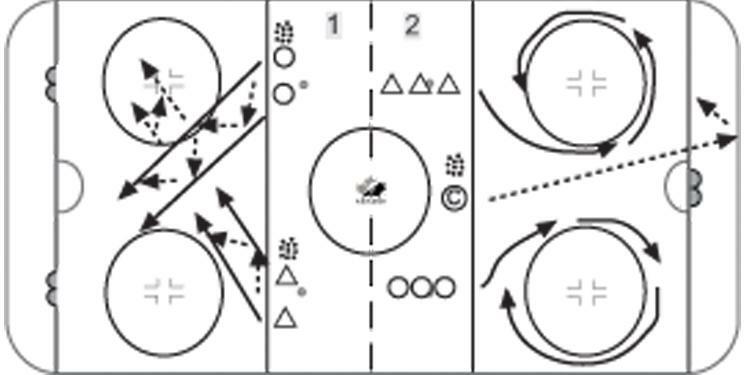 In this edition of Chalk-Talk, we look at two great drills that can be used from Novice to Midget – they can be great warm-up drill or a great game to end practice! Both of these drills are player favourites simply because they drills disguised as games and involve competition. They mimic game situations while reinforcing technical skill & tactics covered in practice. Place nets at one end on the goal line. On whistle, 2 players from each team skate diagonally across the ice, passing the puck back & forth attacking the opposite net, 2V0. If one team scores first, the game now becomes a 2v2 game and the team that scored first tries to steal the puck from the other team and score again.